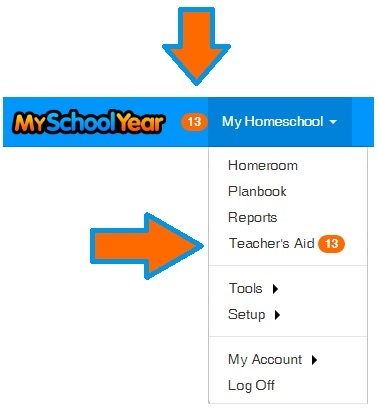 Looking for some assistance on using the www.MySchoolYear.com website? Here are some wonderful helps to use while creating the best school year ever. What is it? The Teacher’s Aid provides a list of recommendations and reminders. A “fix” button is displayed next to the recommendation. Just click it, and it will take you to the exact page to perform the needed task. Some of the alerts pertain to creating lesson plans for a specific class or adding awards, events, or extra-curricular activities for your student. You can easily delete any of these alerts if you choose to remove the reminder. Where can you find it? An orange circle in the navigation header with the number of alerts inside will take you to the Teacher’s Aid with just a click. Or you can visit the page by going to My Homeschool > Teacher’s Aid. What is it? Orange rectangular “Need Help” buttons are provided throughout the site. By clicking on these buttons you will learn information regarding the page you are currently viewing. Where can you find it? At the top right of each page. What is it? We have multiple online help options available including tutorial videos, FAQs, and downloadable guides. Where can you find it? Under the menu My Homeschool > Help. What is it? Blue circles with a white “i” are placed next to fields to give further explanations. These helpful circles will describe options and give definitions so you can make a better decision on how to proceed. Where can you find it? Information circles are located on different areas of a page next to the describing item. What is it? Receive helpful information, tips and discoveries by signing up to our blog. You will read about new features that you may be unaware of on the site. You will also make homeschool planning much easier by learning how to manipulate existing features for your personalized use. Where can you find it? Visit our blog by clicking www.MySchoolYear.com/Blog. Enter your email address in order to receive the latest posts. What is it? My School Year also posts reminders, tips, and tricks on the following many social media accounts. At the bottom of every page the phone number and email for support is made available. Our response time is within 24 hours (1 business day) of contact received during normal business hours. Please take advantage of these helps as you use the site for guidance and direction to help your My School Year experience be the best it can be during your homeschool years!